After a long time I am back with a Thai recipe. Today’s post is “Layered Basil Tofu Rice” .Thai red chili’s & Garlic are cooked along with Tofu & Onion in Sesame Oil, Soya sauce & mushroom sauce. It is then garnished with a generous amount of basil leaves. The curry is then layered with Thai jasmine rice. Tofu was introduced to us after coming to Singapore and now it has become a part of our regular diet. 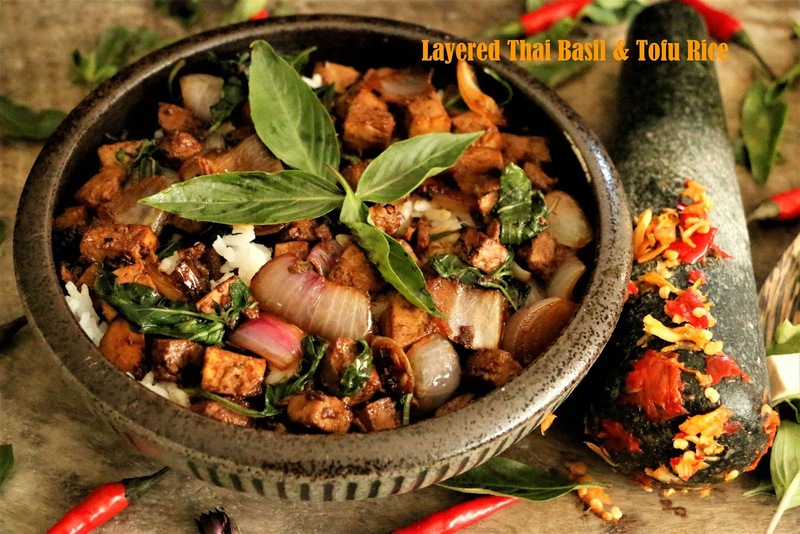 Thai basil tofu recipe is one of our favorite when we go to Thai restaurant. Now this has become a very common recipe at home with some changes from the original menu. 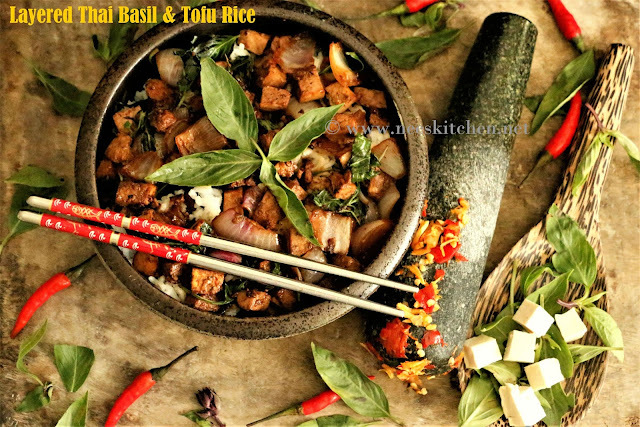 The flavours of Thai style basil and tofu seep into the rice and the mix of flavours in mouth in worth taking in heaped spoonfuls. 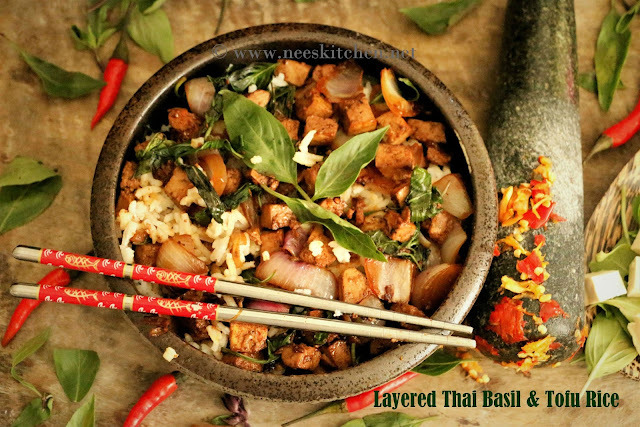 Serve Layered Thai Basil & Tofu Rice Recipe along with Thai Yellow Curry Recipe for dinner or lunch. Thai red chili is very spicy and hence we add some sugar to balance with some mild sweetness. The Red chili & garlic would give the best flavor when they are ground in mortar pestle rather than mixer. Most important point to note is the soya sauce already comes with lot of salt in it. Hence you need to be careful while adding extra salt. 2. Chop the tofu into small cubes after squeezing the water from it. 5. Take a pan, add oil and let it become hot. 6. Add the ground red chili and garlic and fry them well. 7. Add Onion and fry for a minute. 8. Add tofu and continue to fry until they turn golden brown. 9. Add, light & dark soya sauce ,shitake mushroom sauce to this mix. 10. Add very little salt as soya sauce has already salt in it. 11. Mix them all well and fry for 2 minutes. Keep stirring continuously. 12. Add basil leaves and mix them well. Cook for a minute. 13. Take a serving bowl and layer the bottom portion with rice followed by the basil tofu curry. Repeat layering for 2 or 3 times. 1. Salt should be added with caution as soya sauce has already salt in it. 4. You may sprinkle with crunchy peanuts and add a dash of lemon. 5. Cooking time includes cooking of rice in parallel.